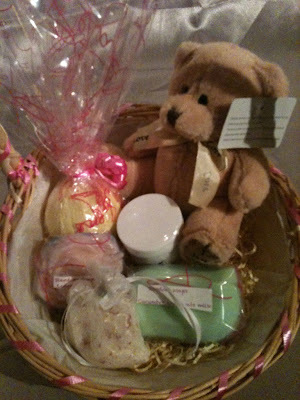 Just wanted to post a wee note bigging up the gorgeous handmade soaps and gift baskets available from Stardom Soaps off ebay. I was lucky enough to receive one of these gorgeous gift baskets from my boss when I finished work and I've loved the products - there was a cucumber soap, a baby-powder smelling soap that was absolutely lush, some bath salts, and a lovely soft teddy as well! Absolutely gorgeously wrapped up and packaged - I felt so very spoiled. So if you're looking for a special pressy for a birthday, bride-to-be or new mum, be sure to check this shop out, new stuff comes up all the time and it's all hand made and carefully wrapped for that extra-special feel - and the prices are great!